Another beautiful day, but the park was too crowded to see much. You are far more likely to find something interesting on a dull wet day with no one around. 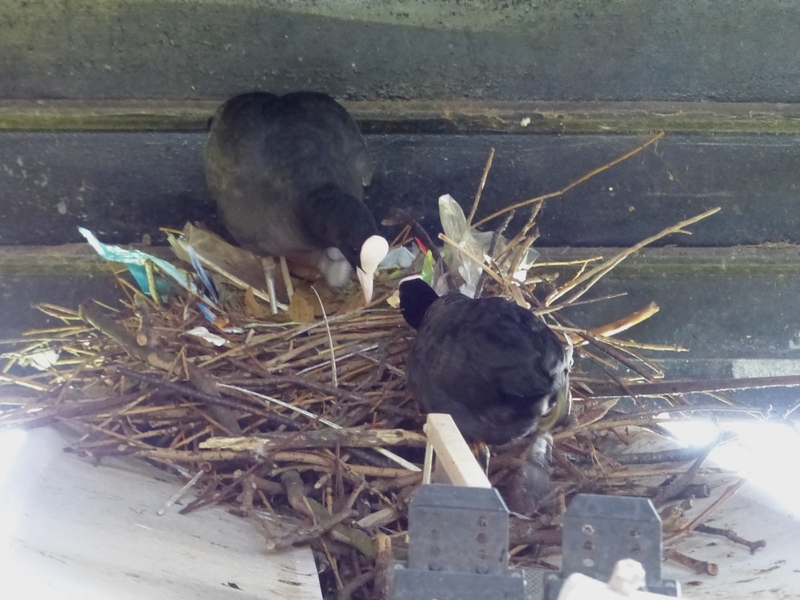 However, something may be happening in the Coots' nest inside one of the small boathouses. The parents were definitely attending to something in the nest. There is only one viewpoint here, looking through a hole in the wire mesh , so it was impossible to see any more than this. In fact the camera does better than the naked eye in distinguishing the details of this shadowy scene. 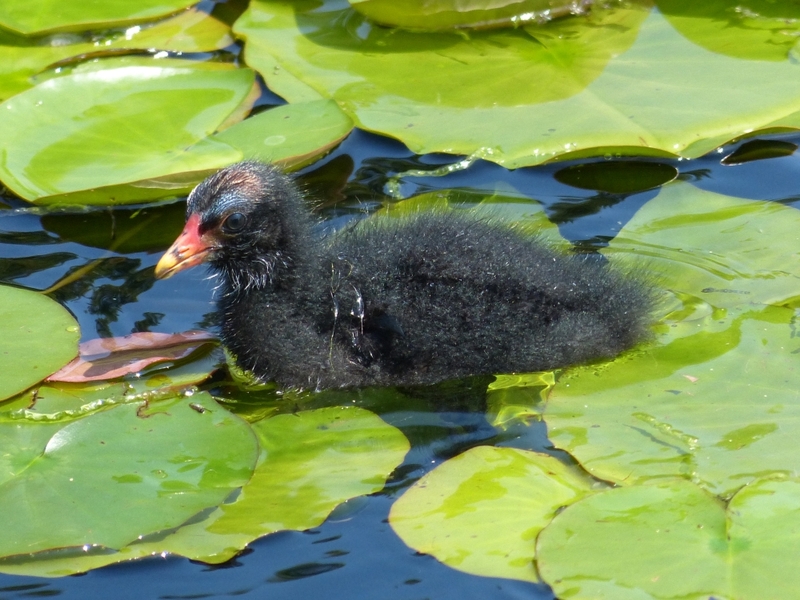 The Moorhen chicks on the pond in the Italian Garden disappeared for several days, and we thought they had probably been eaten by the Grey Herons wich have been lurking in that area recently. But today three of them turned up -- though one had been mislaid in a different pool from the others, and we hope the family will be reunited. 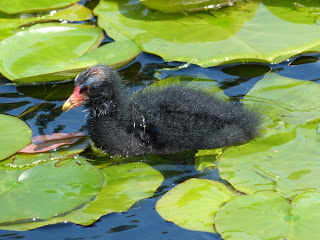 Here one of the chicks tries to stand on a water lily leaf, which sinks under its small weight. There are several Red Crested Pochards on the Long Water, and two of the drakes are now completely in eclipse. Their finery is all gone and they are the same cappuccino colour as the females; only their bright red bills show that they are male. 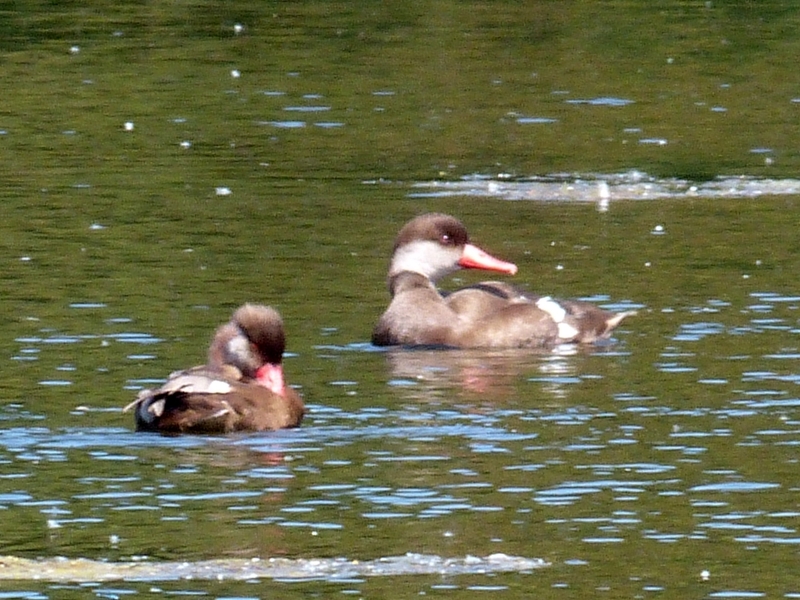 You don't notice female ducks moulting, as the new feathers are the same colour as the old ones. But later this year they and all the ducks will moult their flight feathers, which will be obvious, and they will be unable to fly for several weeks. During this vulnerable time, it is an advantage for the drakes to be drab-looking, as it makes them safer from large avian predators (though not foxes). And yes, the Peregrines which have moved into London can take a full-size duck, as this startling YouTube video, taken with a camera on the falcon's back, shows. 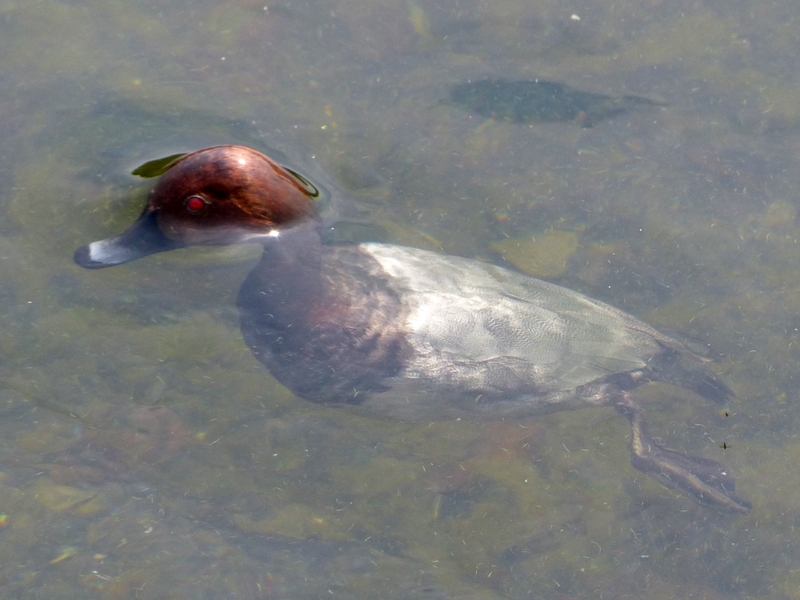 More peacefully, here is a Common Pochard surfacing from a dive. It is remarkable how the water pours over its head in an unbroken stream. I think this must be something to do with the water-repellent nature of its well-oiled feathers.